St Patrick’s Day is a while away but that didn’t stop us from making some salt dough Leprechaun gold coins. I’ve wanted to try making our own salt dough for ages and I found a great recipe for it over on RainyDayMum which I have adapted slightly. Put all the ingredients in a bowl and mix together to form a dough. I turned it out on to a lightly floured board and let my son roll it out and cut out about 20 coins using a cookie cutter. We placed them on a sheet of grease proof paper and I cooked them in batches of 5 on more grease proof paper in the microwave. We have a 1000w microwave and cooked them for 2 minute on each side and left them to cool on a wire rack. 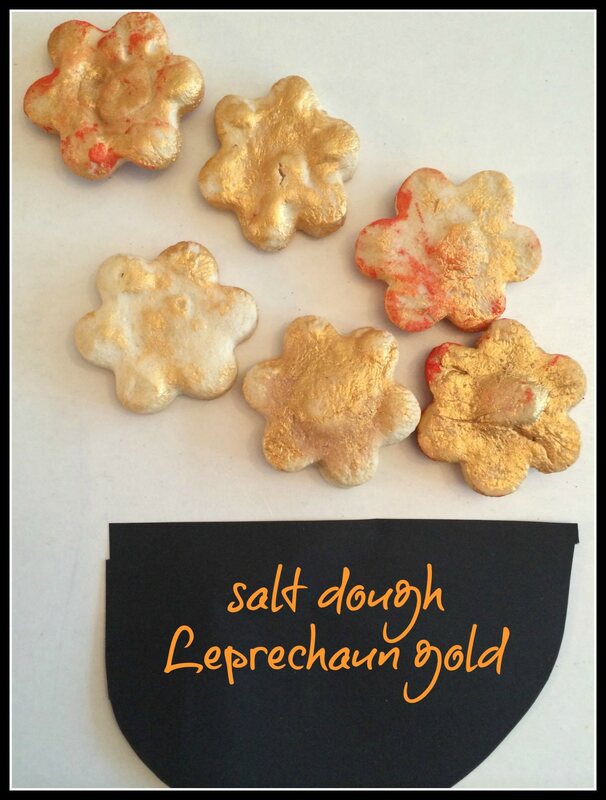 See how we used our salt dough Leprechaun gold to make a pot of gold at the end of the (handprint) rainbow. These look like a really good idea for little ones. Will soon be trying out with J. Thanks for sharing. Lovely craft idea to make with your little ones 🙂 Now where is the rainbow lol ? Lovely, seem easy to make(love the idea of baking them in the oven, genius!) and they look really nice! 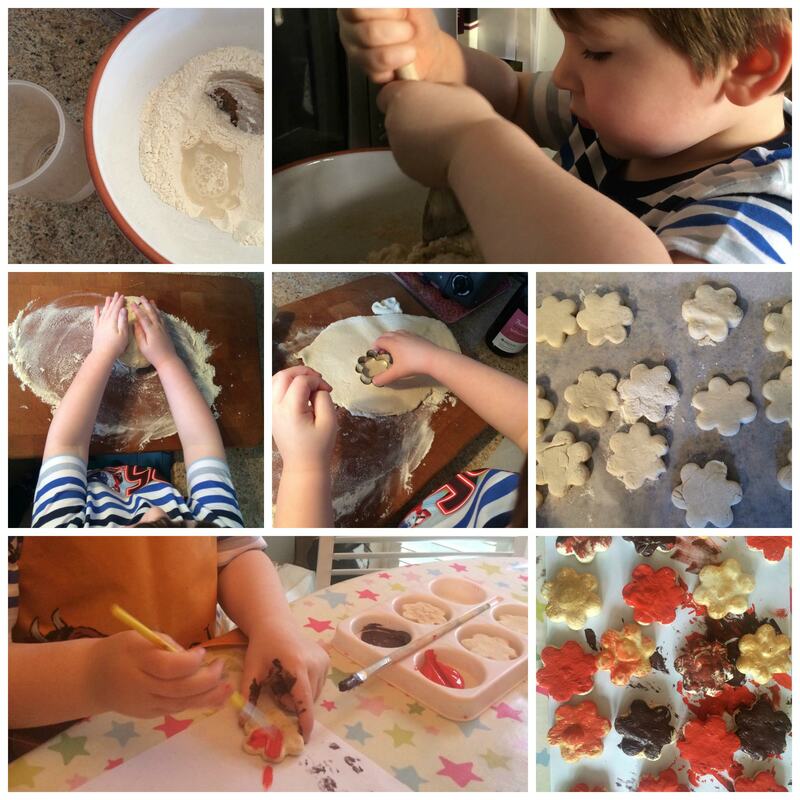 I love salt dough – it used to keep my two quiet for hours! What a great idea! I really must do some salt dough with my two! These look like they’re fabulous for making with little ones, thank you for sharing. Just need that rainbow now – preferably with the gold! What a fun idea. It looks great. What a brilliant idea – there’s plenty of rainbows about at the moment. We’ve never really done much for St Patricks day despite being Irish! Maybe we should do a few things this year! I was really surprised how easy it was to make, cooking it in the microwave really speeds things up too. What a cute activity! We’ve just starting thinking about craft and baking activities for St Patrick’s Day and this is definitely going on the list. Pinned!